The self-improvement sections of bookstores and libraries are crowded with books that tell us how to behave. They explain how we should talk, think, feel, and relate to other people. They describe the skills we need in order to live more healthfully and love more fully, to forgive those who hurt us, to manage conflicts, and to "make peace with anyone." We are overwhelmed by the sheer numbers. Our suspicions may be aroused by the pretentious claims of the authors. And yet, some of these books do contain valuable insights that should be digested thoughtfully and applied sparingly. 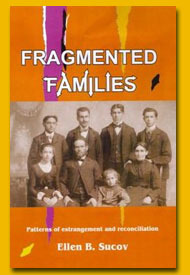 Here are links to worthwhile publications that are congruent with the point of view expressed in Fragmented Families. They are described more fully in the last section of the book. Richard Carlson: Don't Sweat the Small Stuff with Your Family: Simple Ways to Keep Daily Responsibilities and Household Chaos from Taking Over Your Life (Hyperion Press, 1998). Stephen R. Covey: The 7 Habits of Highly Effective Families: Building a Beautiful Family Culture in a Turbulent World (Golden Books, 1998). Monica McGoldrick: You Can Go Home Again: Reconnecting With Your Family (W. W. Norton & Company, 1997). Laura Davis: I Thought We'd Never Speak Again: The Road from Estrangement to Reconciliation (Harper/Collins, 2002). Rabbi Zelig Pliskin: Consulting the Wise: Simulated Interviews with Torah Scholars to Enhance Your Life (Benei Yakov Publications, 1991). Rabbi Pliskin has amplified his own ideas in a more recent publication, Harmony with others: Formulas, Stories and Insights. (Mesorah Publications, 2002). Psychologist Miriam Adahan has written several useful self-help books, all based on Torah precepts. See especially The Family Connection: Understanding Your Loved Ones (Philipp Feldheim, 1995). Readers are urged to send me the names of additional resources that have helped them to clarify and resolve family discord.